This attractive playing card was designed by the Philippine artist, Valerie Jan Villaflor. There are some examples of dualism depicted on playing cards. But I don’t remember any deck with such simple but elegant style applied to courts. Nice. 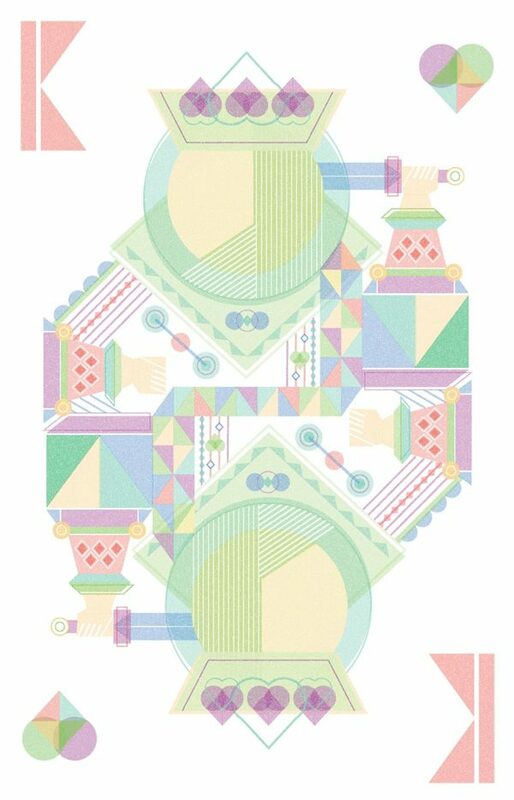 Here are interesting and vivid prints with playing card queens designed by the American artist, Brittney Lee. She created them for the group show titled “Ladies of Animation” (2013, GRworks Gallery in LA). The show was dedicated to artworks of talented women. These four artworks are from a solo art show by Iyan de Jesus, Mechanical Romanticism (Makati; November 22, 2013). They are dedicated to four queens from a deck of playing cards and form the “Queens of Cards” Series. All queens were named in accordance with appropriate historical traditions existing for playing cards. These Vintage French playing card artworks were designed by Moustafa Khamis, an artist from the United Arab Emirates. They have some kind of Pin-Up touchs. Queens designed by the French artist JackPot (JackPot-84). A little project for his fun.